Last week we heard a sample of music inspired by Niccolò Paganini’s solo violin Caprice No. 24, which included Rachmaninov’s Rhapsody on a Theme of Paganini, Op. 43. 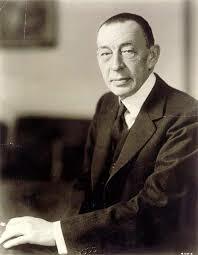 Let’s return to the Rachmaninov and “drop the needle” at one of its most memorable moments, the Eighteenth Variation. 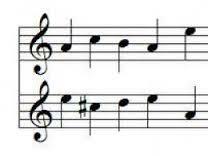 This stunningly beautiful melody seems far removed from Paganini’s original bouncy theme in A minor, but it actually develops from the motivic seed of Paganini’s first five notes (the top line in the example below). Rachmaninov begins by inverting the motive, or turning it upside down (the bottom line). Next, it’s transformed from A minor to D-flat major…a completely different emotional world. Pianist Stephen Hough demonstrates this evolution here. The restless and expansive melody moves away from home, continuing to reach higher, until it arrives at a surprise climactic chord which forces a resolution. Listen to the harmonic tension and occasional dissonance in the lines under the melody. A lot of the Eighteenth Variation’s drama is created by these voices. This performance is from Valentina Lisitsa’s 2012 recording with the London Symphony and conductor Michael Francis. Also listen to a classic recording of Arthur Rubinstein accompanied by Fritz Reiner and the Chicago Symphony.